Small caps designed for text typefaces are drawn to optically match the x-height so they harmonize with both the caps and lowercase. 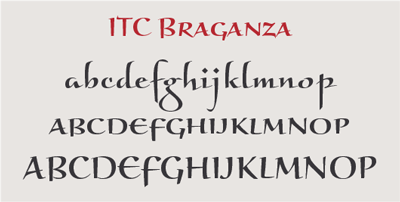 In some designs with small x-heights, such as ITC Braganza, the small caps are designed to work well with the capital letters. 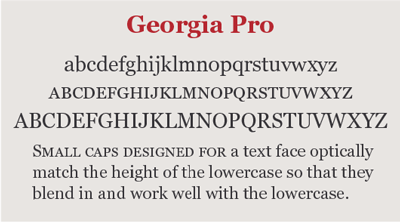 Small caps are uppercase letterforms that are shorter in height than the capitals in a given typeface. When designed as part of a text face, they are most often the height of the lowercase (or very slightly taller), so that they harmonize with both the caps and the lowercase characters. Small caps that are designed for display typefaces have more flexibility in their proportions, and are often taller than the x-height. Designed small caps are preferable to “computer-generated imitations” as they have been drawn specifically to complement the weight, proportion, and spacing of the caps. Conversely, small caps created using the Small Caps function in an application are merely proportionally-reduced capital letterforms. As such, they generally look too light and too tightly spaced, and often too narrow as well. Prior to the advent of the OpenType font format, true-drawn small caps were only available for a limited number of typefaces – and usually as a separate companion font. OpenType fonts allow for a dramatically expanded character set, and an increasing number of them include drawn small caps – making it fast and easy to access these useful characters. Designed small caps (left) have been drawn to complement the weight, color and proportions of the caps. Computer-generated small caps (right) are merely reduced caps. They tend to look too light, and often too tight and narrow. Set in ITC Highlander, Georgia, DIN Next, Parkinson Electra, Soho.